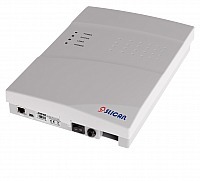 Slican IPU-14 telecommunications server is a product that perfectly meets the needs of small business in modern, multi-task telecommunication. Great price, access to all way of communication and modular build are few of the many advantages of IP PBX Slican IPU-14. There are four free slots that allow to install the necessary equipment at a convenient time for the company. Built-in GSM and VoIP gateways, the ability to record calls, and a free Slican BillingMAN application provide cheap and high quality communications. Choosing multifunctional Slican solutions, you can significantly reduce expenses. Now all that is needed for effective communication is in the IPU-14 IP PBX, Slican applications also make, that communication in your company will meet the highest requirements. Aesthetic design, small size and the ability to hang on the wall are also the advantages of the new server.